I used to roller skate when I was a teenager, but it's been a lot of years since I laced up a pair of boots on four wheels. If you have followed my blog for a while, you know that I am a fan of women's Roller Derby and regularly attend the home games played by our own Thames Fatales and Luscious Lunch Ladies. A good friend of mine, who recently joined the Forest City Derby Girls, offered to help me re-learn to skate, so on Wednesday nights you can find us at the North London Community Centre Adult Roller Skate night, with a bunch of other men and women of various ages and skating abilities. Most of the skaters are in the 50+ age range, and it is pretty darn cool to watch people who have obviously kept their skating chops in fine form over the years show off their speed and fancy footwork. And of course, there's music, courtesy of a DJ, and on a Wednesday night you might hear Adele, Prince or Yaz (who remembers Yaz!) Most bring their own skates but you can rent a pair for just $2.75. I've been going for almost two months, and am doing better than I thought I would, but stopping, and doing cross-overs are beyond my current skill set. I have a much greater fear of falling than I did when I was a teenager, so wrist guards and knee pads are part of my regular outfit. Most skaters favour jeans and t-shirts but there are a few of us who enjoy any excuse to dress up. On the night the photo above was taken, I decided to break out the knit circle skirt I had picked up at Mesh. Paired with an argyle sweater and red knee socks, I was ready to roll. 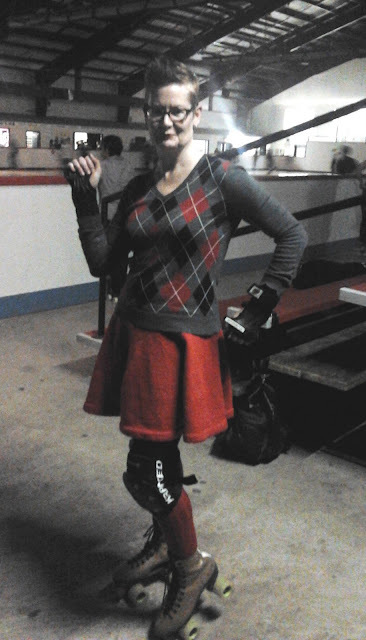 The woman in the photo below, who skates with the London Loco Derby league also has a unique and fun approach to dressing for the roller rink. I love how she has coordinated her outfit with her skates. Photos taken by Heather, using the crappy cameras on our respective smartphones. For more information about roller skating at the North London Community Centre, go here. I am so impressed. Not only are you an athlete, but in a great outfit! Who cares if the photo isn't up to your standards. Your essence is what counts! Obviously, Heather wasn't the only one who was colour co-ordinated! Great look, and more power to you! At this point, I worry alot about breaking bones. Oops--Heather was the one taking the photos. I meant the woman in blue. I loved skating as a kid and teenager but there's no way I could do it any more with my wonky back. Some days I'm lucky to be walking, so skating feels impossible! You gals look GORGEOUS - I am SO GLAD you make an effort to dress up - isn't EVERY occasion an excuse to frock up a bit!? Good for you - I hope you keep going, keeping improving and keep loving it! I know the lighting is awful and the cameras dinky, but I am so glad you posted these! Perhaps in the future we can ask people to step out to the front desk area where the lighting is a little better. I love your blog! It is so entertaining!